Home » Borneo (Kalimantan) » Lake Kakaban : The Lake with the Richest Diversity in the World. Lake Kakaban : The Lake with the Richest Diversity in the World. For all of you who like diving or snorkeling and play safely with non-stinging jellyfish in brackish water lake (only two in the world) you have to visit Kakaban island as your tourism destination. Kakaban island is one of 31 islands which is joined in a group of Derawan islands and in administratively, this island is included in Berau regency, Derawan island, East Kalimantan. If you look at into the map, you can see Kakaban island looks like number 9, where the size of the island is about 774,2 hectare. Number "9" is a group of atoll above sea which is formed a millions years ago. Then for several thousands years ago occurred a lifting process as a result of geological pressure. So the lifting process make atoll lifted into above sea in a height of 50 m then make a number of sea water trapped until it form sea water lake (lagoon). This lake is known as Lake Kakaban. In the language of Bajau tribe, Kakaban means hugging. The naming is related to the physical form of Kakaban island where the atoll in the north hug the lagoon and it's separated from the sea water around it. The lake in the middle of the sea looks so beautiful by the clear turquoise colour. Around the lake, there're many lush mangrove plants. The presence of Lake Kakaban is one of the tourist reason to visit this uninhabited island. Why? Because of the brackish water lake has unique ecosystem as a result of evolution and it involves the process of chemistry, physic, and biology which complex and long for thousands years. A lot of researchers from domestic and abroad try to solve the mystery about how an isolated lake ecosystem could be a home of animals and plants which endemic. The endemic lake which about 2,6 X 1,5 km has became a house for millions of jellyfish where they loss their ability to sting, algal organisms which become carpet at the bottom of lake, the white-color anemon which prey jellyfish, fishes, and other endemic biota. Noted that there are only two kinds of this lake (brackish water lake) in the world such as : Lake Kakaban in Derawan islands and jellyfish lake in Palau, Micronesia, in the region of southeast of Pacific ocean. 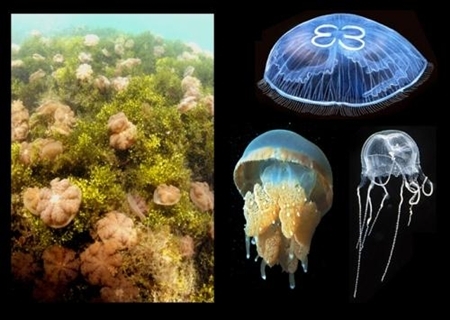 There are 4 kinds of non-stinging jellyfish in Lake Kakaban such as moon jellyfish (Aurelia aurita, 5-50 cm), spotted jellyfish (Mastigias papua, 1-20 cm), shaped-box jellyfish (Tripedalia cystophora, 7-10 mm), and inverted jellyfish (Cassiopea ornata, 15-20 cm). The jellyfish species of Martigias papua has the largest population and it is also the agile jellyfish which usually stay in the bottom of lake with the inverted position. According to the research, the phenomenon of inverted jellyfish is one of form of adaptation (read:evolution) from jellyfish to survive in the isolated lake. The jellyfish is symbiosis with algae to get food. The jellyfish placing algae in their tentacle and move by inverting their body to make algae photosynthesize. By this way, they can make food. Beside of that, the change of morfology looks clearly at spotted jellyfish (Martigias papua). In this lake, the spotted jellyfish no longer has the spotted and the sting sizes is wane and then the function is lost. Regarding to the loss of the ability of a jellyfish sting is caused by there's no predator which prey them in this lake. Naturally, they lost the ability of self-defence system function like the ability to sting. Meanwhile, the anemon who inhabit in this lake change into passive jellyfish predators. The anemon in Lake Kakaban is white-coloured because they don't do symbiosis again with algae. Besides jellyfish, there are 8 fish species which inhabit in this lake. The four most primary species is serinding fish (Apogon lateralis), puntang fish (Exyrias puntang), coral fry (Antherinomorus endrachtensis) and jarum fish (Zenarchopterus dispar). Lake Kakaban represent the form of ancient life which its nature is extreme where it's revealed by a researchers named Jonathan Kindon from the Institute of biology Anthropology and department of animal, University of Oxford. England. The presence of four species of jellyfish make Kakaban island is nominated as area of world heritage site by UNESCO that must be protected. 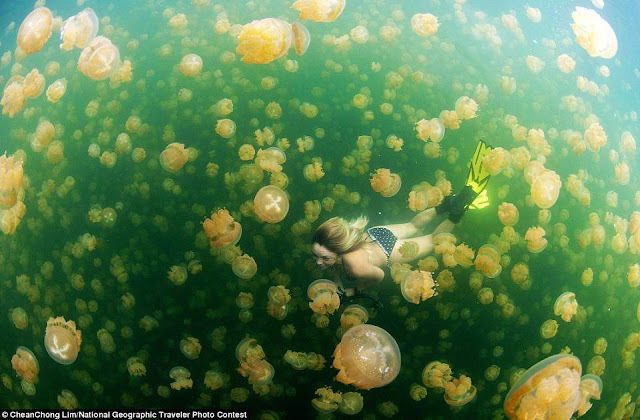 Reportedly, jellyfish lake in Palau has only two types of jellyfish species which are similar. Therefore, we can call Lake Kakaban as the largest jellyfish lake and the lake which has the richest diversity in the world. What Activities You Can Do ? The dock made from meranti wood extends along approximately 120 meters and looks contrast with blue-coloured sea water around it will greet you while you arrive in kakaban island. From the island, before that you have to climb the wood-stair. After that, you have to climb to arrive in the behind of the hill, a place where Lake Kakaban located. The green trees and birds singing will accompany your travel to the lake. Mangrove forest which is formed in Kakaban island is a house for animals, mangrove trees, and another tropical trees like tanjang tree (Bruguiera), api-api tree (Avicennia), and pidada tree (Sonneratia). Snorkeling is a mandatory thing which should not missed when you arrive. Diving in the lake which has mystery of evolution process will become unforgettable activity. Moreover, the presence of brackish water lake is the only one in Indonesia and only two in the world. Besides of that, Lake Kakaban has four kinds of jellyfish, twice as many of the species that inhabit jellyfish lake. You can play with jellyfish where the size is like a tip of the forefinger. They're safe because it dosen't sting like the jellyfish which live in the sea. The plants and animals which inhabit the ecosystem of Kakaban lake basically is the same ecosystem which live in the sea water. In Lake kakaban, you can see jellyfish, algae, anemone, sea cucumbers, sponges, crab, and many kind of fish and many more. However, for a thousands years, the isolated lake caused by the lifting process of atoll make the lake occupants passing the stage of evolution in order to adapt and survive in the environment of brackish water. The lake also accommodate the rain water which later mix with the sea water around that can enter through the coral cracks and create different and rare ecosystem. Besides diving in Lake Kakaban, you also can dive and snorkeling around Kakaban island. The sea around kakaban island already famous as a home of a large number of barracuda fish, bluefin tuna, stingray, napoleon fish, even shark. There are some diving spots which already famous in diving world such as Barracuda Point, The Drift, Cabbage Patch, The Wall, Blue Light Cave, The Plateau, Rainbow Run, Diver's Delight, dan The North Face. To reach Kakaban island, you can use speed boat by the capacity of 15 peoples from Derawan, Maratua, or Sangalaki. It's need 45 minutes from Derawan, 30 minutes from Maratua, and 20 minutes from Sangalaki. The rent price of speed boat is +/- Rp 500.000,00 until Rp 1.000.000,00 that can be used to visit three islands in one day. The closest airport to the Derawan Islands is the Juwutan International Airport, in the city of Tarakan, East Kalimantan. International flights to Tarakan are available on Malaysian Airlines from Kota Kinabalu and Tawau , both located in Sabah, Malaysia. Domestically, Garuda Indonesia and Lion Air fly from Jakarta to Tarakan. From here take an internal flight south by either KalStar or Deraya Airlines (DAS) to Tanjung Redeb in the district of Berau. Boats will take you from here to Kakaban and other Derawan Islands. Alternatively, SilkAir flies from Singapore and Air Asia from Kuala Lumpur to Sepinggan International Airport at Balikpapan, capital of East Kalimantan, then connect by internal flight to Tanjung Redeb.Batavia Air, Merpati and Sriwijaya Airfly domestically to Balikpapan fromJakarta, Surabaya, Makassar. Once in Berau you can hire a speedboat for the 2 hour ride to the Derawan islands. Speed boats generally have a seating capacity of 15 people, and can be rented to take you to several of the Derawan islands in one day.Boats can be chartered direct to Kakaban, but as there are no accommodations there, the usual routes go through its neighbouring islands of Sangalaki, Maratua or Derawan. Kakaban is about 20 minutes from Sangalaki, 30 minutes from Maratua and 45 minutes from Derawan. Bring some foods and drinks when you visit Kakaban island and around it. Please participate in keep the environment of Lake Kakaban, not allowed to throw the rubbish carelessly and also not allowed to ruin the biota of lake dwellers. The sea currents in dive spots around kakaban island is strong enough. Rather than fight the current, you should ask someone use speedboat to pick you up at the end point of the dive. 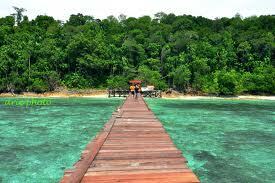 Visit Kakaban island together with many friends will save more your money, for example the rent price of speed boat. The more friends you bring, the less your costs to rent a speedboat. Kakaban island is uninhabited island. To fulfill your accommodation, you can choose resort in Derawan island , Sangalaki island, or Maratua island. In Derawan, there are many inns or cottages which is located around the beach by the price start from Rp 50.000,00 until Rp 400.000,00 /night. The needs to rent snorkeling tools can be found in the nearest three island with Kakaban island. Maratua Paradise Resort is the closest resort to Kakaban Island, and is the only accommodation on the island. 8 beach chalets and 8 water villas all come equipped with double or twin beds, hot water, and air-con. Room rates are inclusive of breakfast, lunch and dinner, and coffee and tea throughout the day. Facilities include a restaurant, dive rental equipment and dive courses. Derawan Dive Resort, on Derawan Island, has 27 traditional Kalimantan style cottages, each equipped with air-con and hot water. Facilities include a floating restaurant with a superb sea view and a delicious selection of international and local delicacies. The resort’s dive center is located on the beach with reliable dive equipment rental and professional dive guides. 7 boats are available for travel around the archipelago and back to mainland Kalimantan. Derawan Homestay is a much cheaper lodging, nestled amongst the palms trees of Derawan’s sandy beaches. Rooms range from 100,000-150,000 rupiah per night, while the new bungalows on the sea cost from 200,000-250,000 per night. Facilities include a restaurant, and organized fishing trips and diving trips. WOW! That's some awesome pics man! Love the jellies! The 2nd pic (aerial view) is the jellyfish lake in Palau / Rock Islands, I have only been to that one, but Kakaban is on my list! Have you been to both? What are your thoughts / preferences? First of all, there are more than 1 brackish lake here in Palau. Five of all the brackish lake are home to 5 different subspecies of Mastigias papua (M.papua remeliiki, M.papua saliii, M.papua etpisoni, M.papua nakamurai, and M.papua remengesaui), and the ancestral jelly is found outside in the lagoon area (Mastigias papua). Secondly, all four jellies that you mentioned above all stings. Starting from the deadliest one to the mild one (Box jelly, Cassiopea, Aurelia, then Mastigias).